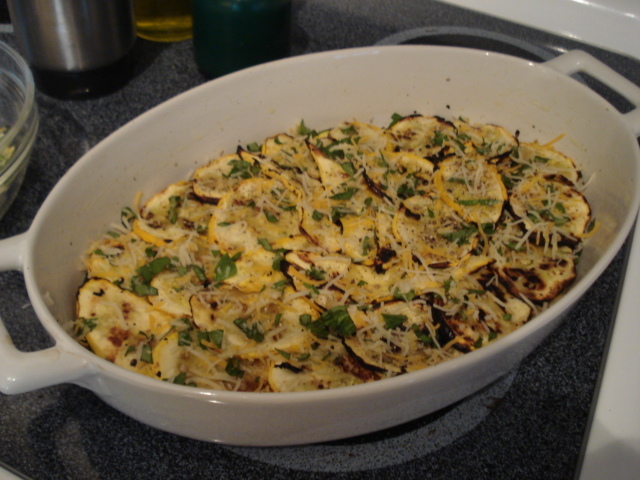 I saw a recipe in Cooks Illustrated for Squash Gratin that served as the inspiration, but I ended up creating my own version. In Cooks Illustrated , the goal was to reduce the moisture in this dish, but they also wanted to keep it a relatively quick dish to prepare. 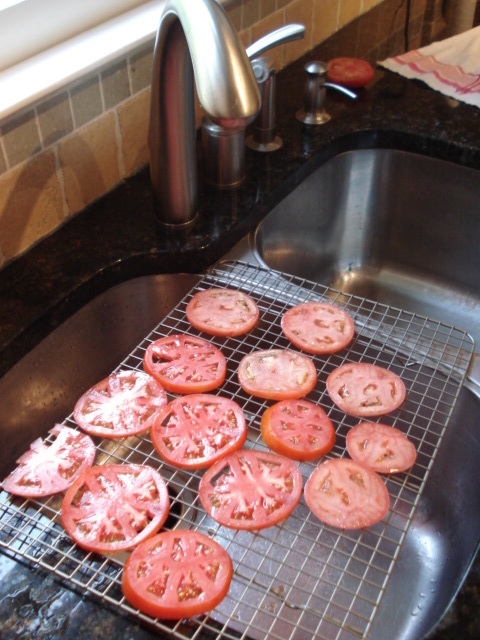 Z&S and tomatoes can be so watery, so their solution was to heavily salt and drain them for at least 45 minutes. I decided to grill the Z&S, mostly for flavor reasons, but I’m so glad I did because I think grilling reduces the moisture even more than a quick salting, and the final product was pretty much at the maximum juiciness I would have wanted to eat. Begin by slicing the Z&S into 1/4" slices. Wish I had a mandolin! 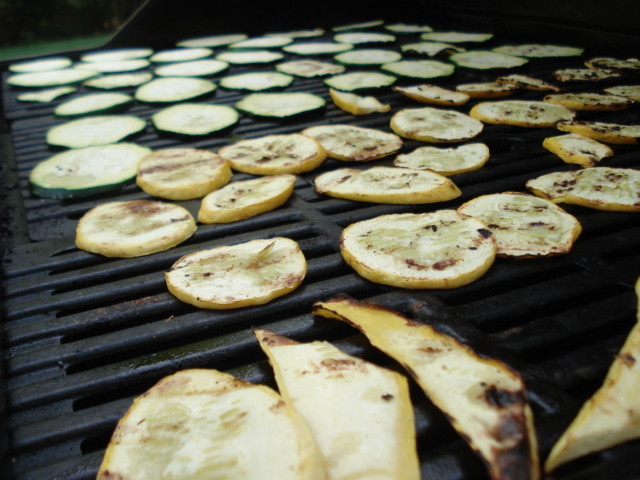 I sprinkled them with salt and a spritz of oil and onto the grill they went. You could certainly sautée them, but broiling would be even better. When they’re done they should be medium-crispy little chips. While the Z&S cook, slice the tomatoes into 1/4" slices as well. 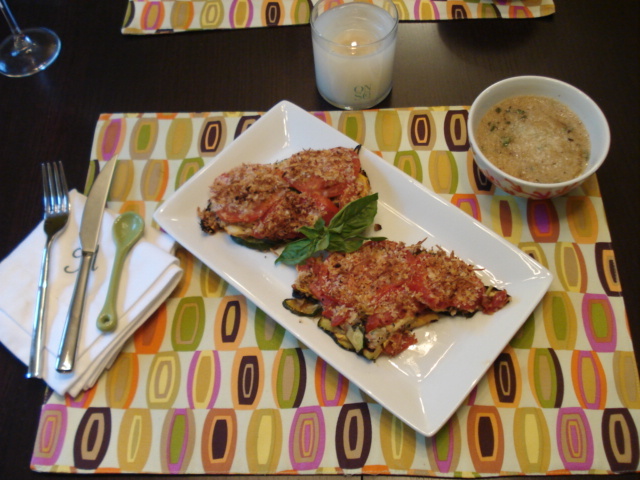 I used the same method as we used with eggplant: a fair amount of salt and a rest above the sink. I’d say they sat there about 25 minutes throughout the prep of the recipe. Preheat the oven to 350* at this point. Heat a small skillet and sautée the garlic in 1/2t oil until slightly brown. 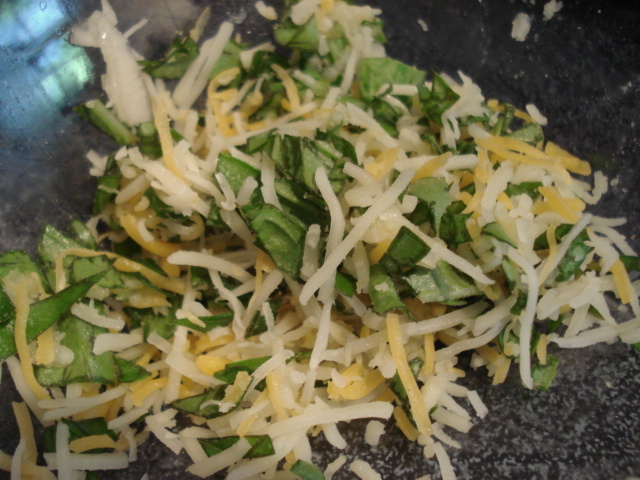 Combine with 1/2C of the shredded cheese and 1/4C chopped fresh basil and mix well. 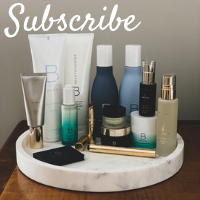 To assemble, use a 9X9 baking dish. Anything larger and you’ll have to increase the recipe – anything smaller and you’ll just have more layers! Give it a quick spray and begin layering the Z&S. Allow each "chip" to slightly overlap its neighbor. 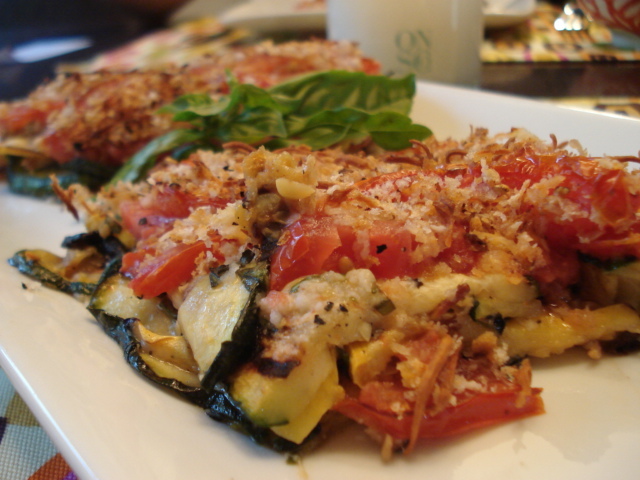 Once you have a complete layer, sprinkle with some of the cheese, garlic, basil mix. Everything should be salted enough, but I recommend a healthy peppering. 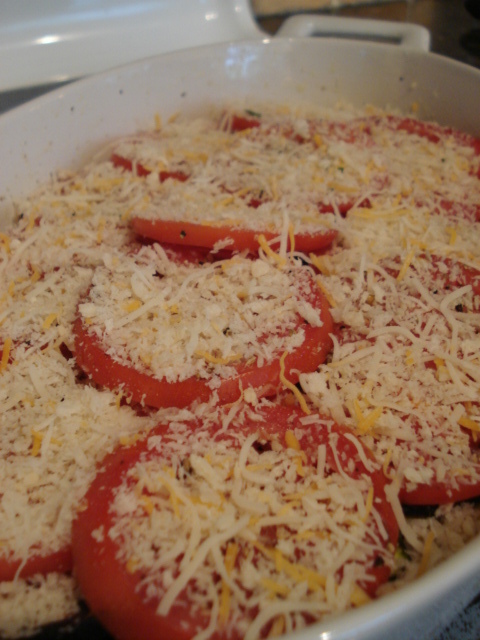 Continue layering the Z&S and cheese until you run out – then layer the tomatoes on top. Combine the rest of the cheese with the panko and sprinkle over the entire dish. Yum! 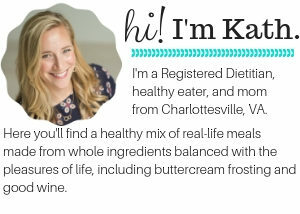 And the whole recipe is just under 500 cals! 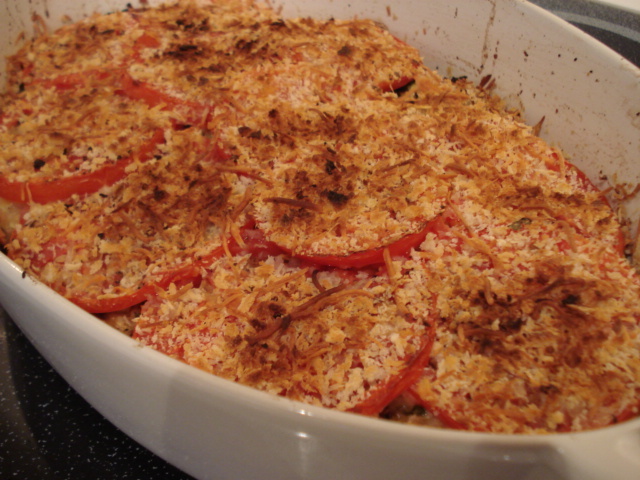 The gratin turned out wonderful. A bit cheesy, a bit crunchy, and very filling. We’ll definitely be making this again – with all kinds of variations.